See, I told you this was unbiased. I’m actually putting Little Brother, that farming factory in Lansing, ahead of Michigan on this list. Sparty is our first program to start off the top 10 best of the best. Tip of the cap to Sparty sports information director Jeff Barnes who informed me that Michigan State trotted out six (6!!) different uniforms last season. Not six different combinations…six different sweaters!! By far the most of any other team in the nation and we have all six featured here for you. Given MSU stitched together six sweaters, this review might be longer than the others, but let’s start with their classics, because that’s why Michigan State is ranked this high. 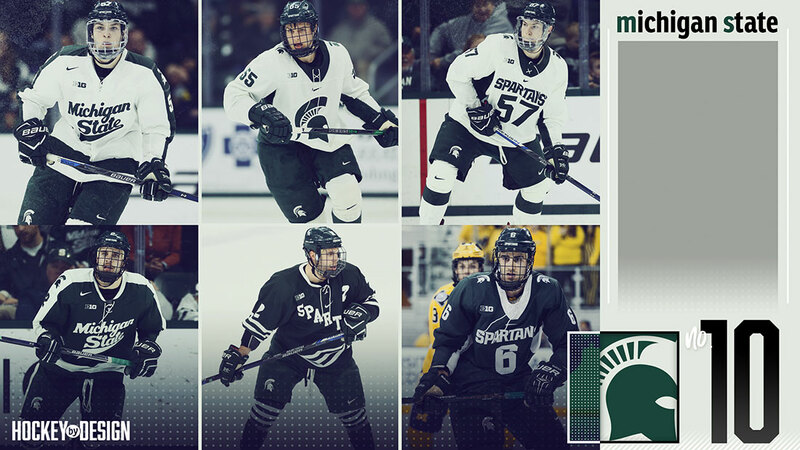 Sparty’s green and white script uniforms are not only a thing of beauty, they’re an iconic look in college hockey. The unique-looking Michigan State script has seemingly been a part of MSU’s repertoire for a long time, but it’s certainly aged well. It’s a gorgeously-constructed script for the front of a jersey and nothing else is needed to compliment it. Much like Northeastern’s red uniform with the long, white stripe running along the entire sleeve on both sides, Michigan State has done this with opposing colors on the green and whites and it’s a thing of perfection. To top it off, the Spartan head, which flips sides on each shoulder, brands this college hockey uniform just as good as anyone. MSU’s white sweater with the Spartan head on front is bold, sharp and speaks for itself. Some green is added down the sides and under the arm, but not enough to deter that look. The shoulder numbers are spaced well from the additionally shoulder Spartan logos, giving this get up a clean, classic look as well. The thick green collar on this is the only thing I’d maybe thin out a bit, but I do appreciate the contrast. Much like MSU’s script font unis, Sparty trotted out a green and a white offering that looked more like a linebacker jersey than a defenseman’s. The branded ‘Spartans’ wordmark above the Nike-specific font create solely for Sparty is certainly a nice look, but it’s very big and boxy on the front. I don’t have a problem with it, but the number size needs to come down a bit, I think. Lastly, MSU donned a horizontal, green Spartans jersey with a lot more striping that its other five counterparts. The uniform showcases the jersey number on the opposite side of the wordmark, much like Minnesota, and is a great look for an alternate uniform, but certainly can’t overtake the classic looks that Sparty already possesses. Lastly, the pants and helmet stay the same on all six jerseys, and they work in every single instance, which is an impressive feat. Can I stop saying nice things about my rival schools now? Army! This maybe the surprise of the countdown as the Black Knights claim the Atlantic Hockey throne for best uniforms in the conference. Ever since Army West Point went through its complete overhaul and rebrand, which includes mentioning West Point as part as Army’s official name now, the Black Knights have one of the sharpest, coolest and most identifiable looks in all of college athletics. Is Army going to get the blue chip athletes? Probably not – they may receive some of the bravest and most selfless, but what Army has done is embraced its identity and went full tilt with it. Army’s black and white uniforms are essentially mirror images of one another. Let’s break them down as one in the same. The Army wordmark/number font in front? Exquisite. Branded perfectly. It looks INCREDIBLE on a hockey uniform and is certainly one of the most unique looks in the game. How about the captain’s “C” being in the same font, looking as Army as a hockey uniform ever could. Then the Black Knights go ahead and add that bold, brace star with “West Point” underneath it and you can almost feel the pride of the jersey being worn just by looking at it. All the shoulders need is that incredibly powerful logo Army unveiled not too long ago. No need to fuss with anything. The sleeve and jersey piping is spot on, as well. The only thing I’m not entirely crazy about with Army’s gold is the actual color. Aside from that, the actual aesthetic of the uniform is fantastic. The logo on the front looks great blown up as is and the black numbers compliment the gold jersey very well. 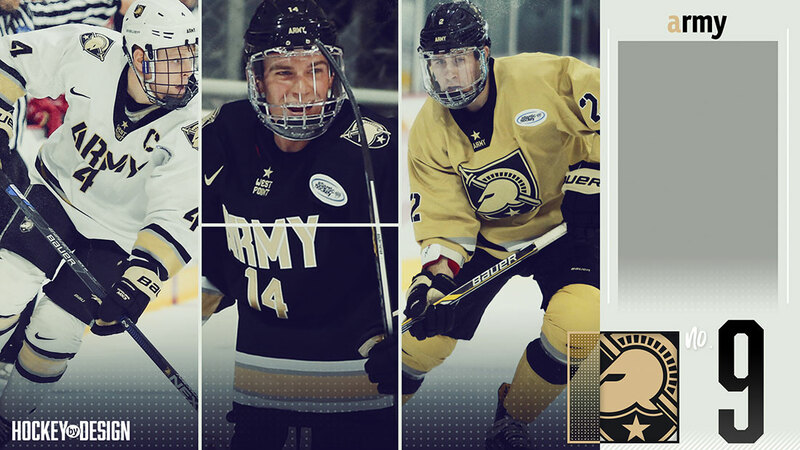 Huge, huge fan of what Army has reinvented itself and it shows in its incredible hockey uniform. As a Boston College employee and someone who is firmly affixed in the Battle of Comm Ave (the common nickname given to the BC – BU rivalry), I’m going to get destroyed for putting Boston University this high, but I’m a man of integrity and I think the Terriers have earned this spot. It’s only for one reason, though: he throwbacks BU added to the mix. Did I hate the Terriers’ original uniforms they had, depicted in both the top and bottom in the middle slot? Nope, but they didn’t really convincingly win me over, either. I’ll start there, though. 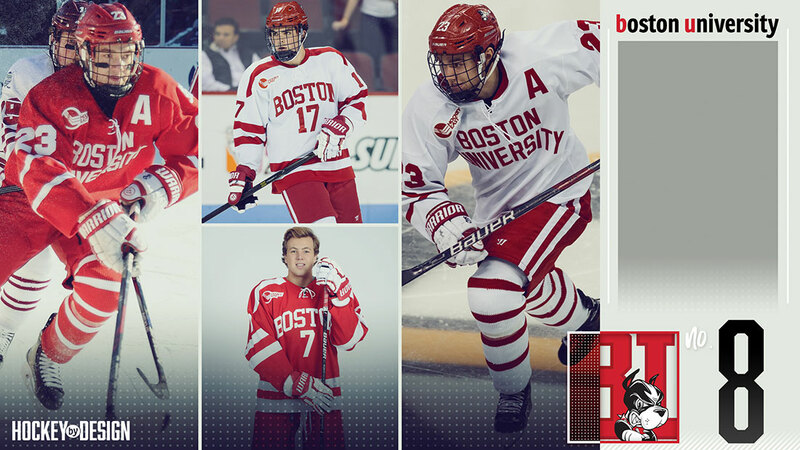 BU’s red and white home and away getups are actually a complete, two-color flip of one another. The pants stay red and the two colors swap on the sweater (except for the collar). 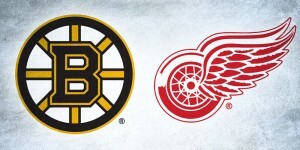 They’re plain and simple: Boston and the jersey number. Does it piss off this BC guy that they like to think they claim the city by just saying Boston across the top? A little bit, but it also makes sense, too. I don’t really care for the thick, two-pronged shoulder yoke, but everything else is just fine. Now for the reason BU is as high as No. 8. The Terriers originally trotted out these red throwbacks about two to three seasons ago, either for the Beanpot or possibly a game at Fenway Park, I can’t remember. I was a big fan of them, particularly the four-striped sock with big gaps in between. You’ve never seen anything like that before. The front of the jersey is what sold me, though. The Boston, straight across, with University underneath it in a slight, inverted arch made my eyes bulge. Then a year later, BU came out with a white version. Holy moly. Incredible. I think I enjoy the white version more because the red pants break up the ketchup bottle look, on the all red version. Having said that, on the white uniform, I wish BU’s pants were a solid red, but that’s just me being nitpicky because I have to be because they’re my archrival. I hate how good these are. 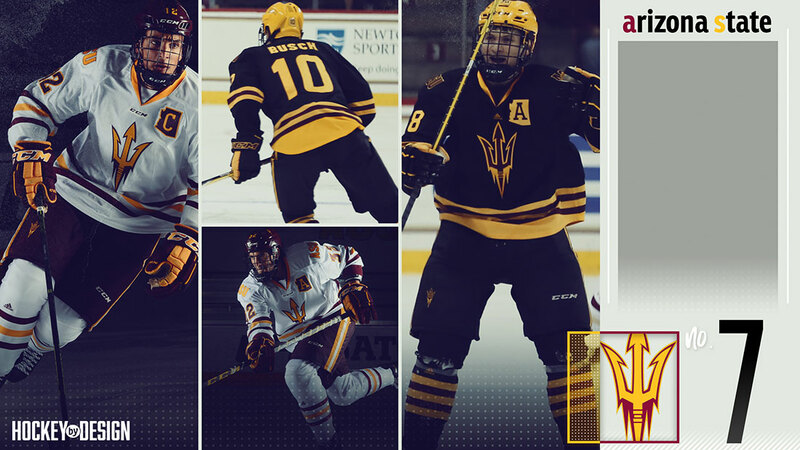 The newest kids on the block, college hockey’s 60th program, comes in bringing heat from the desert as the Sun Devils scorch into the No. 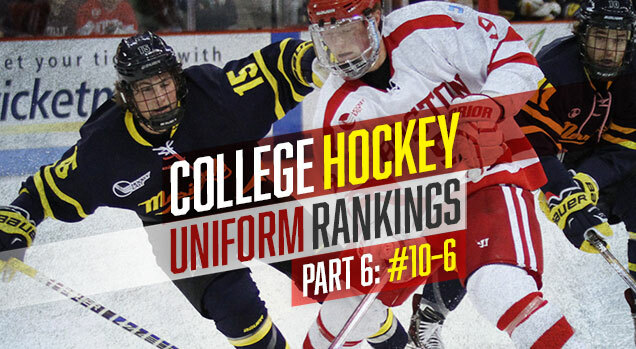 7 slot in our college hockey rankings. What won me over with ASU’s two offerings wasn’t the overall look and feel of the uniform but the little things that added up. The white and black Arizona State offerings are pretty similar but what stands out to me is how perfect Sparky’s pitchfork logo is for the front of that jersey. 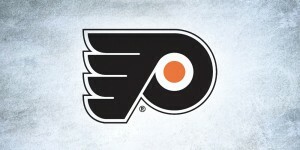 Aside from the classics, I’d argue it’s one of the sharpest, sleekest logos you could put on a hockey sweater. 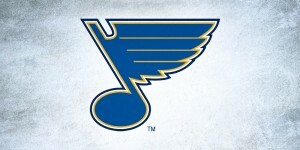 I personally think it looks better on the white jersey because is stands out a bit more. The three-stripe piping system is par for the course in college hockey, but the fact that the captaincy and assistant captaincy is outlined in the state of Arizona is seriously one of the coolest idiosyncrasies I’ve stumbled across in my findings. The ASU mark on the shoulder is a nice, touch, too. In all honesty, I have Arizona State this high because I have so much hope for what they produce down the line. It might not be fair, but I think this look is sharp enough to warrant this high a ranking with some front-end stock for the future. A maroon uniform with that gold pitchfork on it? Count me in. Cheer, cheer for old Notre Dame. I’ve really softened up on being mean to my rivals, haven’t I? Well, the Fighting Irish gives their college hockey fans plenty to cheer about in the aesthetics department. The Irish skated out four uniform options last season, two of which were much more supreme than the other pair. Notre Dame, another Under Armour school had two somewhat uninspired uniforms crafted but the other two, the navy uniform with the shoulder patch and the green getup? Man o man is it tough to find a school to top that combo. Let’s start with the basic home whites and navy. I mean, they’re nice! The striping is pretty basic, but I like how on the whites, the sleeve is all blue and the white shoulder dips into the blue sleeve at the top, creating a nice negative space effect. The interlocking ND and number below it in the blue portion of the sleeve gives it a clean, classic Notre Dame look. The front, however? It’s pretty dull…and really big. It’s not terrible, but I just think that Under Armour or someone could have come up with something a bit more branded to Notre Dame’s look and feel. The all navy look is very similar to the whites, without the negative space impact up top. Luckily for the Irish (see what I did there…), Notre Dame has the two other uniforms that screams its name. The blue version with the Notre Dame university patch on the shoulder is fantastic, and the gold collar, to boot, works pretty nicely here, as well. For me, though, what stands out most is that Gothic, Notre Dame-y type font which I feel should be present on the white uniform. But I love how it’s presented here, with gold lettings, thinly stroked in blue and white, giving it incredible pop in a subtle way. I don’t care what people say…I think Notre Dame’s green uniform is amazing. When you have a tiny leprechaun as your mascot and your team name is the Fighting Irish, if you don’t have an all green option, you’re obviously doing it wrong. These are absolutely brilliant. Not only do you have nice, subtle striping with it, but you win me over even more with the ‘Irish’ script on the shoulders! 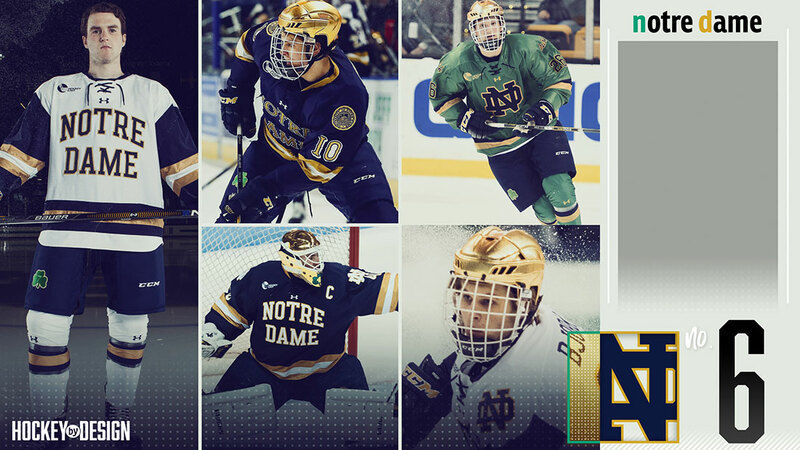 There’s no extracurriculars going on here – it’s the ‘ND’ block logo in blue, exquisitely outlines in gold with a nice-looking blue hockey lace as even more enhancement. Don’t think I forgot about the golden buckets. If you’ve never seen them in person, it’s hard to do these things justice. They’re literally blinding. They are so shiny and pristine, they should honestly feel bad wearing them to play. I mean, they’re nickname is the ‘domers’, as an ode to Notre Dame’s famous golden dome on campus. The football team obviously wears the golden helmets, and we already know how I feel about Michigan and OSU replicating those looks on the ice. Incredible work out of the Irish on these.